We asked our contributors to answer a couple of questions we thought would help eMail marketers take stock of the year past and plan for the year coming. As editor of The eMail Guide, I’m proud to say you’ll find their answers very insightful and helpful. So, enjoy 10 bloggers blogging! Biggest mistake you saw eMail marketers make in 2009? The biggest mistake I saw was not the addition of social buttons into emails but, the addition of social sharing functions into email marketing without a solid plan of what marketers were going to do differently with these channels. So many marketers I noticed wanted to not miss the boat of joining the social media rush; but adding Twitter, Facebook and LinkedIn without a plan of engagement or measurement around the use was a mistake for many. I think that this was a true learning year for many marketers around social media and I am hopeful that email marketers will see it as another communications channel and treat it differently from email. The cadence, frequency and uses can be so different even when sharing so many similarities. I also hope that they realize that there is a two-way commitment in using these channels that are not a controlled and planned as they typically approach email marketing. It is a commitment of more time and resources than many have yet to understand. If you could see eMail marketers do something differently in 2010 what would that be? Move faster. In looking at how many consumers and customers now engage, the campaign planning that is often done is too far out to work in the daily changing landscape of marketing, timing and competition. By the time that the campaigns roll around many factors have changed and having the ability to react and be nimble is important to gain greater leverage over the opportunity of timing. Planning is still very important but being more agile in your execution is going to win in 2010. Testing to smaller focused segments is going to help with this shift. Thank you for allowing us to share some ideas and participate in meaningful dialogues with many of you around the world. Sites like The eMail Guide are a great resource for all of us and we hope to add more to the conversation in 2010. Not understanding the difference between “bounce rate” and “inbox placement.” They are very different. You must track them both. The first is a measure of list quality and the second is your opportunity index. If you don’t reach the inbox, you cannot earn a response. Inbox placement is the first line of opportunity for response and revenue. You can’t manage and optimize it if you aren’t tracking it. I’d like to see email marketers earn their rightful place at the digital marketing table. Email is a great dialog channel (like social and event marketing) and great for traffic driving (like search and webinars) and great for retention (like a blog or newsletter). Email drives a tremendous amount of revenue and response. Yet, still, email gets treated like an inexpensive tool and not as a strategic weapon. Broadcasting and over mailing will cease to be effective very soon. Email marketing needs resources and some TLC for segmentation, targeting and content strategy. You look great today! Thanks for being part of this community! Send feedback! (And fruitcake). 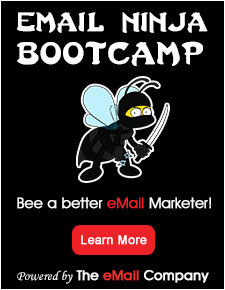 In 2009 one of the biggest mistakes we saw small businesses make was stepping up their email campaigns a bit too late. Instead of building good relationships with their customers throughout the year, many businesses waited until they desperately needed sales from their customers and then bombarded them with emails. So these businesses were in their customer’s inboxes when they needed the customer, not necessarily when their customer needed them. Nail Your Email Marketing through testing and customer surveys. Your customers are your lifeblood in these economic times so in 2010 it’s going to be even more important to make sure you put as much thought as possible into how you communicate to them. Test a different format, or a different day to send your email campaign. Squeezing an extra few opens, clicks and sales can make a huge difference for your business all throughout the year. Also make sure you are sending regular surveys to your customers to find out how they rate your product, your company and customer support. Find out what you can be doing better, then tell your customers how you’re changing your ways in your next email newsletter because you’ve heard their message. On behalf of VerticalResponse, I’d like to thank you for following my posts on The eMail Guide. I hope you have found the posts useful, and would welcome any suggestions on future topics you’d like to see covered from an Email Service Provider. We hope you have a safe and wonderful holiday season with your friends and family, and look forward to posting again in the New Year! One of the biggest mistakes we saw marketers make during 2009 was not respecting the preferences of their subscribers. On behalf of Port25 Solutions, we’d like to extend warm wishes for a Happy and prosperous New Year. The entire email industry is one large growing family, and, one of the elements we admire most is its level of commitment toward fighting spam and proving that email is the nervous system of communications. We consider ourselves lucky to have peers so dedicated toward their craft. Here is to email! In 2009, I saw many marketers switch email service providers (ESPs) because they were not happy with their inbox deliverability. However, when they moved to a new provider, they forgot that they are in control of much of their own deliverability. If your deliverability is on the fritz (read: decline), a good starting point is usually to look internally. Are you sending timely, targeted, relevant email to subscribers who have asked for it? What does your opt-in process look like? Are you setting proper expectations around content & frequency? Are you sending too much email? Not enough? 2010. In a perfect world, I’d like to see two things. First, I’d like more resources dropped into email marketing. Heck – it’s the highest (measurable) ROI of any online channel and yet typically email marketing is a fraction of someone’s full-time job. Most “email marketers” also manage the website, the SEO, etc. I’d love to see the C-suite invest time and money into this lucrative channel. Second – and this is certainly not new – I’d love there to be more testing. Don’t guess on what day or time is the best to send or what subject line or copy or creative will garner more opens/clicks/conversions. Take advantage of the tools your ESP offers. Take the time to do the A|B testing that is necessary to maximize results. Test. Test. Test. Tweak. Test. Test. Test. Send. Review. Happy and safe holidays to all and to all from all of us at Blue Sky Factory! Not having a full grasp of what the law requires around sending email. Normally, this would be okay, since not everyone is expected to know every tendril of law ever written. However, when email marketers begin moving away from an understanding of CAN-SPAM, their intent becomes skewed. As well, I saw a movement from a lot of marketers (not all of course) where permission was seen as being more expendable than it has been in the past. The more comfortable you are with not following CAN-SPAM, the easier it is to also move away from the best practices that raise the bar from CAN-SPAM to actual permission based marketing. While you may be in compliance, not receiving permission to email someone degrades the customer experience and thus the relationship with the email marketing entity. Revisit why they’re engaged in email marketing in the first place. For some, this won’t be a long process since they have a clear vision. But, for others, be it money, conversions, list size or quantity of email send over a certain period of time, I would recommend refocusing your efforts around both the recipient experience and the brand you represent. Personally, I feel like the inbox has come under assault with marketers being too lax in thinking a recipient’s expectations are in line with their own and they just send away — ISPs have come to this conclusion. There’s discussion of CAN-SPAM being revisited so I think it’s safe to say the government is starting to feel this. Marketers will get caught being defined externally if they don’t find ways to do it responsibly and internally. Forcing recipients to give up on their email because the messages they want are so overpopulated with those they don’t, move to another email address or just see it as less of a 2 way communication mechanism, will hurt the entire industry in the end. We have the power to reinvent and define ourselves (as both vendors and marketers) so hopefully 2010 will help lead this charge. Without having an audience, it would make everything we pundits have to say moot. So, with that in mind as well as the holidays, thanks so much for following me and my peers in the email industry and have yourself a fantastic holiday season. Add a preference center: List churn is around 30% annually. A preference center would allow subscribers to update their address and set frequency and content preferences. The same study shows that subscribers who set preferences have 50% higher levels of engagement. For marketers who already have a preference center, work on making it easy to find and enticing to subscribers. Changing preferences can feel like a chore – dry language and placement with other account admin options. Many customers opt to unsubscribe rather than go through the hassle of updating their preferences. Happy Christmas from LA, big thanks to everyone who took the time to read TheeMailguide posts and share their comments. Over mailing (recency / frequency) especially around holidays along with untargeted email – even simple gender targeting, one message does not fit all. As well, there are still folks out there who think it’s OK to purchase, rent or share lists. From my perspective inside the arts & culture industry, I would have to say my biggest complaint is that many galleries, artists and organizations will design and launch an email campaign without any links, landing pages or social media options attached. More often than not there is not even a web-hosted version of their email! Engagement is currency for the arts, and a press release by email should be the tip of the iceberg for communications between and artist and the audience and not a means to an end unto itself. Everyone talks about video in emails but frankly I would rather see live chat embedded in an email campaign – I usually have immediate questions if I am interested at all. As well, again specifically aimed at the arts and culture sector, please make sure emails are added right away to your list and that there is a personal greeting as confirmation. I’ve handed out hundreds of cards (especially at the Toronto International Art Fair 2009) asking to be put on an email list and so far I am maybe getting about a dozen galleries sending news to my inbox. Thanks to the great community involved with The eMail Guide! Great topics, lessons and discussions that are invaluable to marketing as a whole and Jeff and Jim are tremendous resources for our industry. Thanks for following and happy holidays to you all! The biggest mistake I saw eMail markers make was thinking that they could do what they wanted to do for less money and in an unrealistic timeline. We saw too many companies come to us with projects that had no budget and unrealistic time expectations. Wake up marketers! Just because it’s eMail does not mean it should be free and doable in a day. 2) Something to track. We were forced to run a number of campaigns that did not have links to click through to the website. 3) A way to track conversions outside of the campaign. Closing the loop is our middle name. Best wishes to everyone in #eMailmarketing. A happy and safe holiday and great success for 2010. Think eMail marketing and get in The eMail Guide. So, what have you learned this past year that you would like to pass along to others? We invite you to share your eMail wisdom with the community by posting your comment! Thanks to all for the great read, we hope to avoid some of these common mistakes in 2010! I can only echo what Jeff said so well! Thanks to all and to all a great holiday! I just wanted to thank all of our blogger for making this a great post and for helping shape the content, tone and flavour of The eMail Guide. Jim and I really appreciate your support and participation.